Fish sauce – This is a simple sauce of fermented anchovies, water, and salt. The flavor isn’t fishy when you add a tiny bit to food. Instead, it imparts a savory depth of flavor that will blow your mind! There’s a great article on Serious Eats about ways to harness the umami flavor in all kinds of world cuisine. Fresh ginger – Makes everything taste fresh! Buy some ginger root, chop it up, and store in your freezer if you’re not going to use it frequently. Sambal olek- Chili paste. It’s like a thicker, chunky version of sriracha sauce. I’ve used it in my African pork tenderloin recipe here. Ready for an easy starter Thai recipe?? Here you go! 1. Bring a medium pot of water to a boil and chop all your vegetables. Prepare your sauce in a small bowl by whisking together peanut butter, soy sauce, water, chili paste, and fish sauce. Set aside. 2. Add soba noodles to the boiling water and cook for 4 minutes while completing the remaining steps. 3. Heat canola oil in a 10″ skillet. Add the garlic and ginger and sauté for 1 minute. 4. Add the julienned vegetables to the oil, ginger, and garlic. Sauté for an additional 2 minutes. 5. Drain the soba noodles and toss into the skillet. Add apple cider vinegar, brown sugar, and sauce. Stir to coat. Add chicken or shrimp at this point, if using. 6. Serve hot and garnish as you wish. 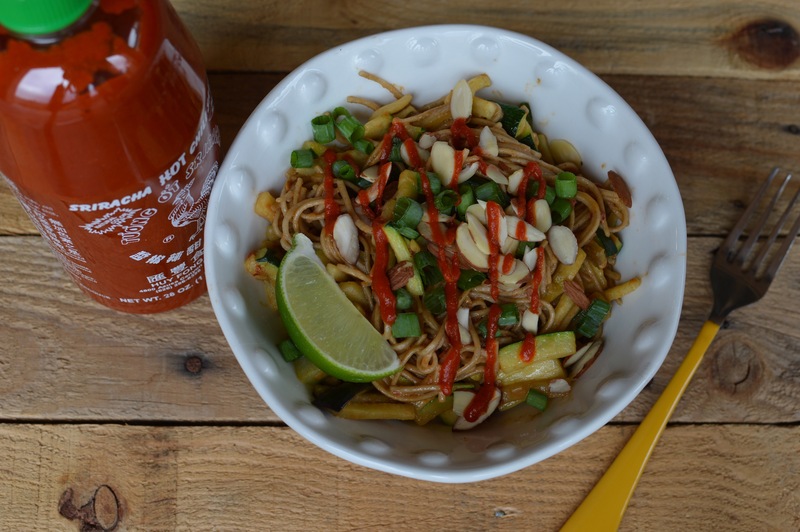 I like my noodles with a squeeze of lime, some chopped green onion, sriracha, and sliced almonds! Seriously, don’t be intimidated by the longer ingredients list here! This dish is fantastic and super quick to make. It’s not a traditional “pad thai” dish, though. If you’re looking for something more authentic, head over to my friend Laura’s new blog, www.earth2laura.com, where she shares recipes for world cuisine. 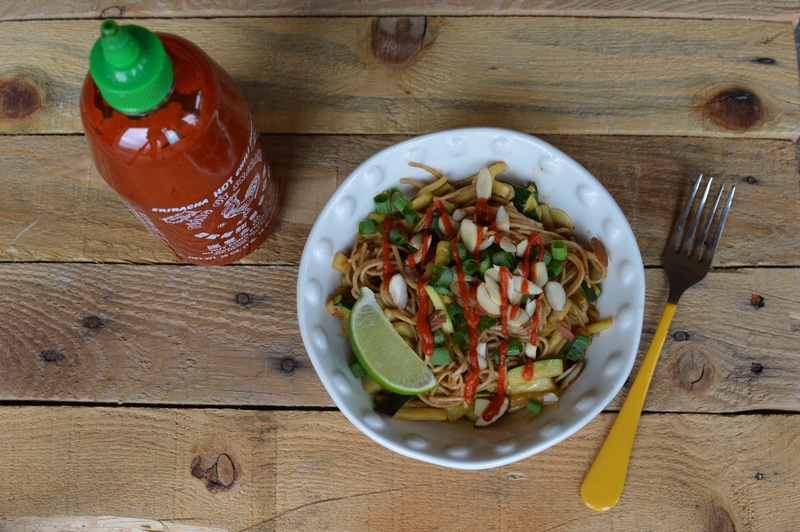 Today she is featuring a legit pad thai recipe!